Of course. One of our experienced estimators will come to your home and provide you with a complete estimate free! Always. We can help with any insurance claim, start to finish. Yes. Our company has all the proper licensing for El Paso county, Pueblo county, and Teller county. We carry more insurance than most roofing companies. Should I use someone who has just knocked on my door? Not until you have checked to see if that company is licensed, insured, and a local reputable company. Always check the BBB. Yes, we carry workman’s comp insurance which means, no subcontractors–all our employees work for us. Is you company a “green” company? We recycle 100% of all the old roofing shingles. Can you roof my patio roof? Absolutely. We have many products for patio roofs including ALX the walkable patio roofing. Do you do roof certification? Yes we do. 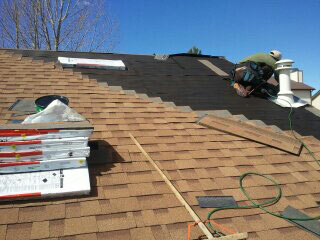 Whether it is for the sale of your home or insurance reasons we can do 2 to 5 year roof certifications. Do you have a financing? Yes. We have for your re-roof project or your repair. Yes! We have no hassle warranty policy.